This panorama was taken by an astronaut looking southeast across the South American continent when the International Space Station (ISS) was almost directly over the Atacama Desert near Chile’s Pacific coast. The high plains (3000–5000 meters, or 13,000–19,000 feet) of the Andes Mountains, also known as the Puna, appear in the foreground, with a line of young volcanoes (dashed line) facing the much lower Atacama Desert (1000â€“2000 m elevation). Several salt-crusted dry lakes (known as salars in Spanish) occupy the basins between major thrust faults in the Puna. Salar de Arizaro (foreground) is the largest of the dry lakes in this view. The Atlantic Ocean coastline, where Argentina’s capital city of Buenos Aires sits along the Río de la Plata, is dimly visible at image top left. Near image center, the transition (solid line) between two distinct geological zones, the Puna and the Sierras Pampeanas, creates a striking landscape contrast. Compared to the Puna, the Sierras Pampeanas mountains are lower in elevation and have fewer young volcanoes. Sharp-crested ridges are separated by wide, low valleys in this region. The Salinas Grandesâ€”ephemeral shallow salt lakesâ€”occupies one of these valleys. The general color change from reds and browns in the foreground to blues and greens in the upper part of the image reflects the major climatic regions: the deserts of the Atacama and Puna versus the grassy plains of central Argentina, where rainfall is sufficient to promote lush prairie grass, known locally as the pampas. The Salinas Grandes mark an intermediate, semiarid region. 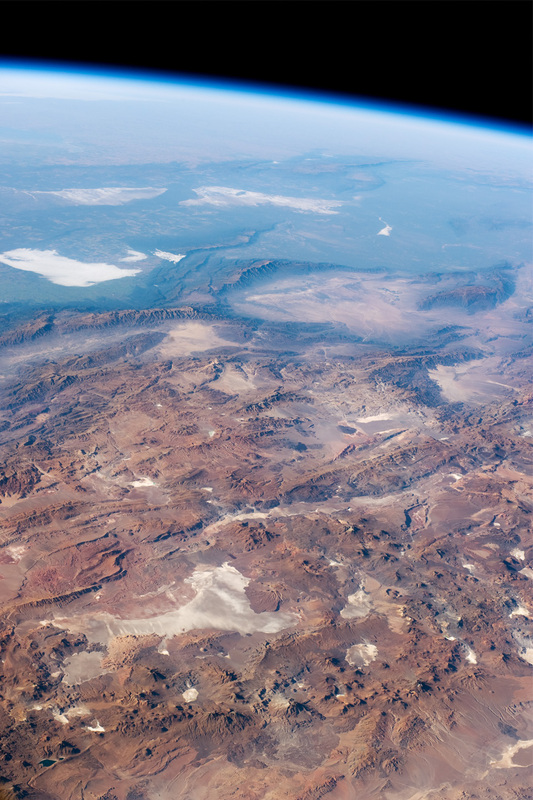 What accounts for the changes in topography between the Puna and the Sierras Pameanas? The geology of this part of the Andes is a result of the eastward subduction of the Nazca tectonic plate underneath South America. Seismic data suggest that beneath the Puna, the Nazca Plate is dipping down steeply. Beneath the Sierras Pampeanas zone, however, the underlying Nazca plate is almost horizontal. The levelness may be due to the subduction of a submarine mountain range known as the Juan Fernández Ridge. In the simplest terms, ridges are topographic highs that are difficult to stuff down into the subduction zone, and that has profound effects on the volcanism and structures of the overlying South America plate. Astronaut photograph ISS023-E-28353 was acquired on April 26, 2010, with a Nikon D3S digital camera fitted with an 80 mm lens, and is provided by the ISS Crew Earth Observations experiment and Image Science & Analysis Laboratory, Johnson Space Center. The image was taken by the Expedition 23 crew. The image in this article has been cropped and enhanced to improve contrast. Lens artifacts have been removed. The International Space Station Program supports the laboratory as part of the ISS National Lab to help astronauts take pictures of Earth that will be of the greatest value to scientists and the public, and to make those images freely available on the Internet. Additional images taken by astronauts and cosmonauts can be viewed at the NASA/JSC Gateway to Astronaut Photography of Earth. Caption by M. Justin Wilkinson, NASA-JSC. 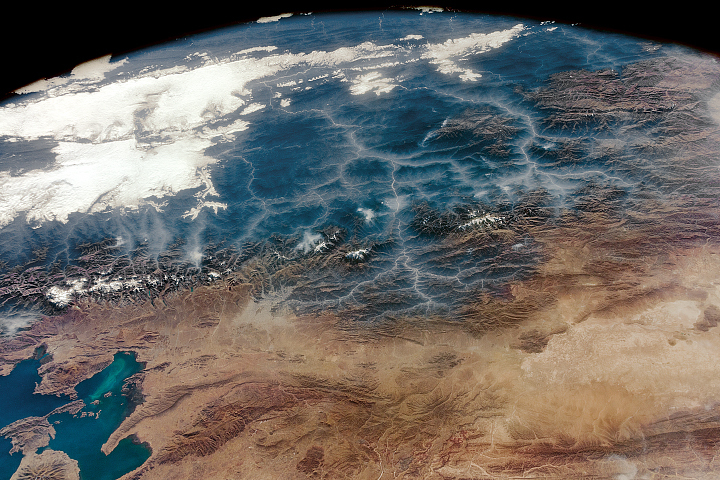 A panoramic view of South America from the Atacama Desert in the Andes to the Atlantic Coast is captured in this astronaut photo from April 26, 2010.